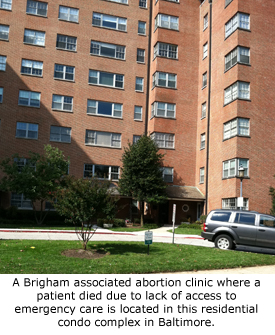 The MD Dept of Health and Mental Hygiene closes all four Associates in Ob/Gyn abortion facilities, after finding that clinic employees, as standard protocol, administered Misopristol to all patients past 11 wks without a physician present. Maryland issues the emergency suspension of the clinic's license after receiving an anonymous tip from a patient about severe legal violations at the Associates in Ob/Gyn office in Baltimore. Maryland issues the emergency license suspension of the Associates in Ob/Gyn clinic in Baltimore, after finding numerous deficiencies including the a botched abortion on February 13, 2013 that resulted in the patient's death. Maria Santiago, age 38, goes into cardiac arrest and dies after a 12.5 wk abortion performed by Dr. Iris Dominy at Associates in OB/GYN Care in Baltimore. The deficiency report shows several violations of public health code at the Baltimore clinic, including: 1) emergency equipment was not in working order, 2) staff were not trained in basic life support, 3) clinic medications were expired, 4) surgical instruments were not sterilized.